"Grace and gumption . . . The Ninth Hour is a story with the simple grace of a votive candle in a dark church." "The Ninth Hour, like Colm Toíbín's Brooklyn, evokes a narrowly confined, simpler, largely bygone world. But McDermott also addresses big, universal questions — about what constitutes a good life, and about how to live with the knowledge of "that stillness, that inconsequence, that feral smell of death." Her novel encompasses base hungers, sin, guilt, reparations, secrets, and depression — so little understood at the time. And more: The Ninth Hour is also about love, both forbidden and sanctioned, albeit with the caveat that "Love's a tonic ... not a cure." This enveloping novel, too, is a tonic, if not a cure." "Tour de force . . . [Alice McDermott] reminds us of the pleasures of literary fiction and its power to illuminate lives and worlds. . .McDermott is a virtuoso of language and image, allusion and reflection, reference and symbol . . . McDermott once again demonstrates her expansively attentive literary care and its quiet power." "McDermott . . . sees a world within those dusty parish halls, tenements, bars and funeral homes whose interest is inexhaustible. With the precision of a master. . .McDermott lays bare the reasons why those "small lives" matter. . .A great McDermott novel." "Superb and masterful . . . There are so many ways to read this beautiful novel: as a Greek tragedy with its narrative chorus and the sins of the fathers; as a Faulknerian tale out to prove once more that the “past is not even past”; as a gothic tale wrestling with faith, punishment and redemption à la Flannery O’Connor; or as an Irish novel in the tradition of Anne Enright and Colm Tóibín, whose sentences, like hers, burn on the page. But “The Ninth Hour” is also a love story, told at a languid, desultory pace and fulfilled most satisfyingly at the end." "[A] stunner . . . McDermott's language is, as always, precise and lyrical.."
" [T]he story is exhilarating, largely because of McDermott's lyrical language and unforgettable characters . . . [T]he nuns of the Little Nursing Sisters of the Sick Poor . . . are as fierce, funny, complicated and brave as any women in our fictional universe today." "National Book Award winner McDermott (Someone) delivers an immense, brilliant novel about the limits of faith, the power of sacrifice, and the cost of forgiveness." "In this enveloping, emotionally intricate, suspenseful drama, McDermott lures readers into her latest meticulously rendered Irish American enclave . 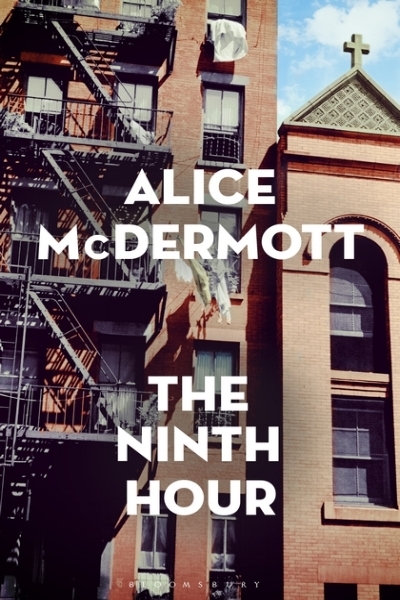 . . Like Alice Munro, McDermott is profoundly observant and mischievously witty, a sensitive and consummate illuminator of the realization of the self, the ravages of illness and loss, and the radiance of generosity . . . McDermott’s extraordinary precision, compassion, and artistry are entrancing and sublime . . . This is one of literary master McDermott’s most exquisite works." "McDermott illuminates every­day scenes with such precise, unadorned descriptions that the reader feels he or she is there, hidden in the background. The agony of the sick in body or mind, the guilt over ignoring church doctrine, the power of love to erase loneliness—each is treated with McDermott’s exquisite language, tinged with her signature wit. Her latest is highly recommended—a novel to savor and to share. "The National Book Award winner delivers another exquisite novel in which those who at first appear unremarkable—in this case, nuns in early-20th-century Brooklyn—are revealed as heroines, unflinching in their devotion to the flawed humans around them." Available in the UK, Ireland, & the British Commonwealth from Bloomsbury on October 19, 2017! "Beautifully written, heart-wrenching and funny by turns, and offers a deeply vivid and authentic portrayal of Brooklyn long before its hipsters arrived." "A skilfully spun tale of an Irish immigrant family in 1940s Brooklyn whose lives are torn apart by an unquenchable fire, a child born into tragedy and the residual grief of an untimely death." "Dealing in simple lives and small dramas, the prose displays an unerring sense of detail, mood, and emotion. A masterful American writer at her best." "McDermott’s is an individual tale that will resonate with many."